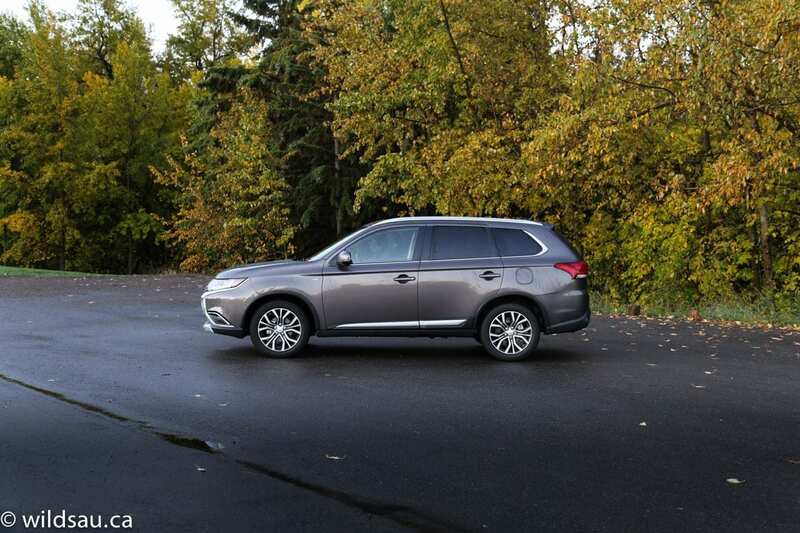 The redesigned 2016 Outlander puts a new face forward. What the heck is an Outlander? As far as the word goes, it simply means foreigner, or stranger. Interesting choice for a vehicle name then. 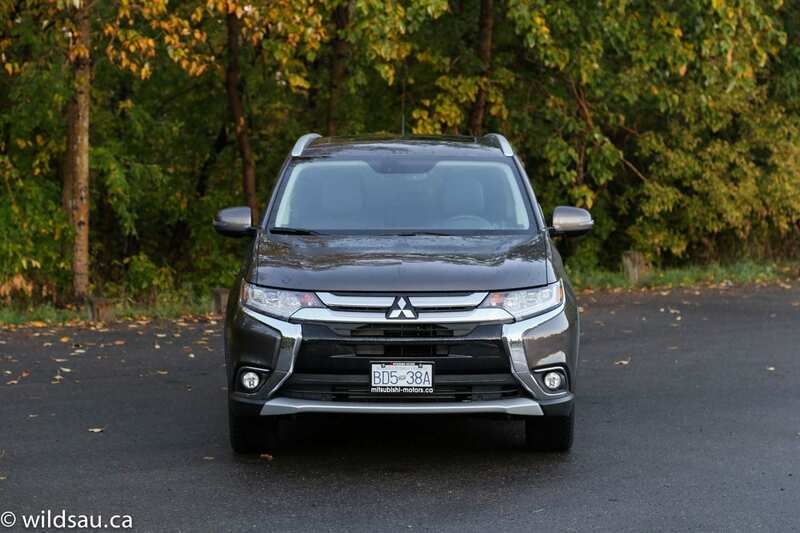 As you may have seen, Mitsubishi has been crowing on TV and in other media about the 100+ enhancements that the new 2016 Outlander benefits from. They come in the form of exterior and interior styling, as well as refinements under the skin. 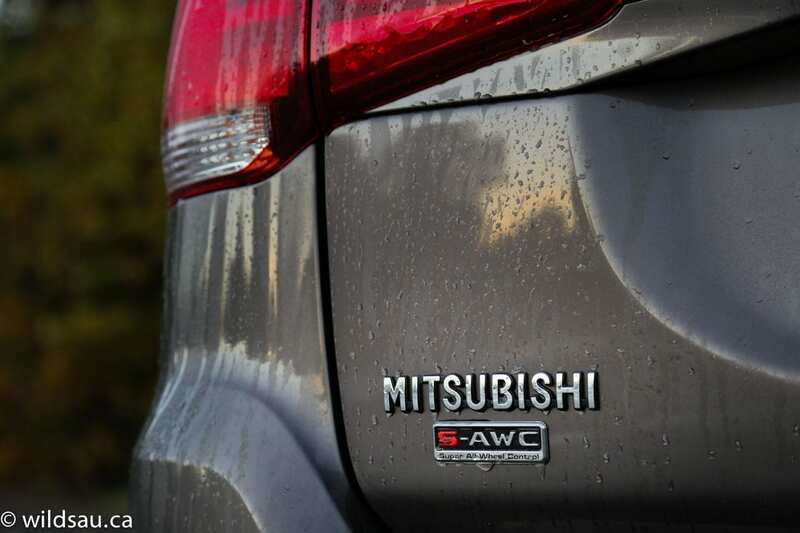 Mitsubishi set out to differentiate the new Outlander from the competition and visually they’ve succeeded. At the front anyway. For better or for worse, the front fascia’s styling won’t be confused with anything else out there. I actually don’t mind the distinctive but horribly-named “Dynamic Shield” grille – you can’t miss it with its huge chrome and piano-black accents. 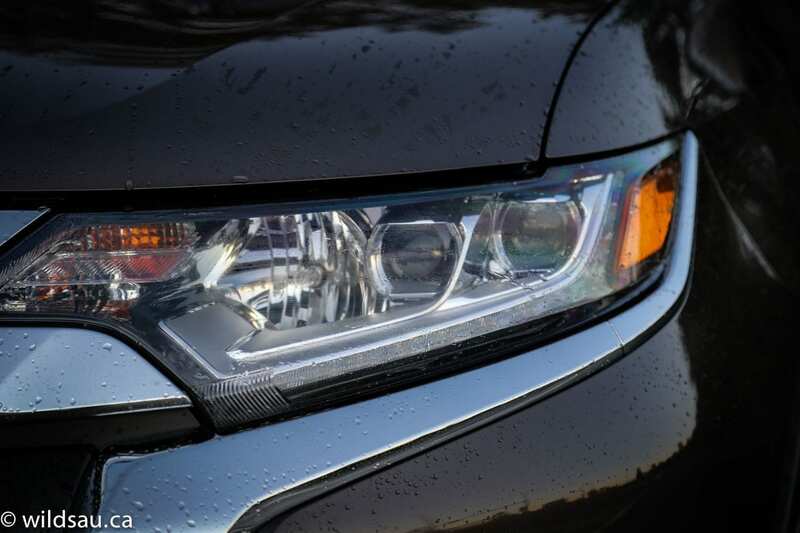 The new LED headlight pods are accented with attractive LED-strip driving lights, which give the Outlander an interesting signature look as it’s coming your way. 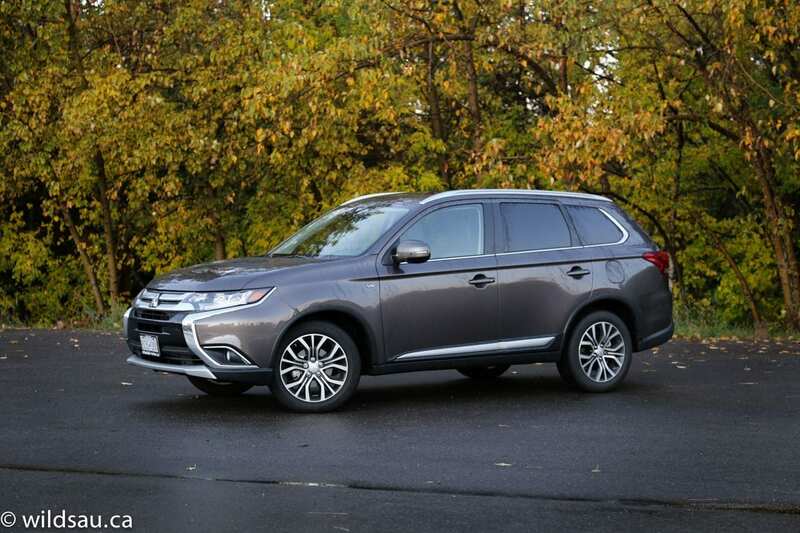 Otherwise, the Outlander stays in the rather-bland lane, with just a few other exterior refinements such as all-new 18-inch wheels, the lower side cladding, a gently revised lower rear bumper and LED tail lights. Once you get in, you’ll find a nice cabin. Nothing here jumps out as spectacular, but there’s absolutely nothing bad about it either. 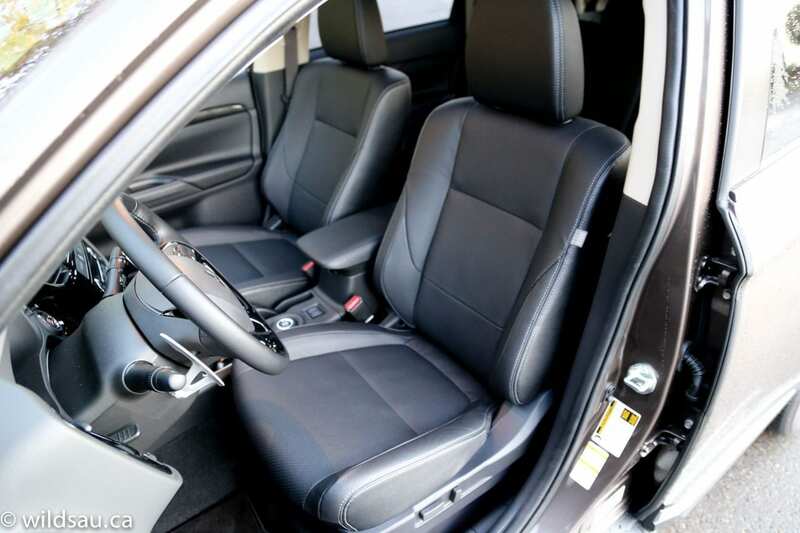 The materials are nice, though certainly not best-in-class – you’ll find plenty of soft-touch plastics, and little goodies like contrasting stitching on the seats and some new glossy trim. The interior styling is relatively clean although it felt somewhat chunky – a large expanse of dash stretches out ahead of you and a large boxy centre stack juts out of it. The heated leather seats are comfortable, but not very well bolstered, and at this price, it bothered me that only the driver’s seat is power-adjustable. The new leather-wrapped steering wheel feels fantastic, and sits in front of a standard set of gauges and a nice full-colour driver information screen. 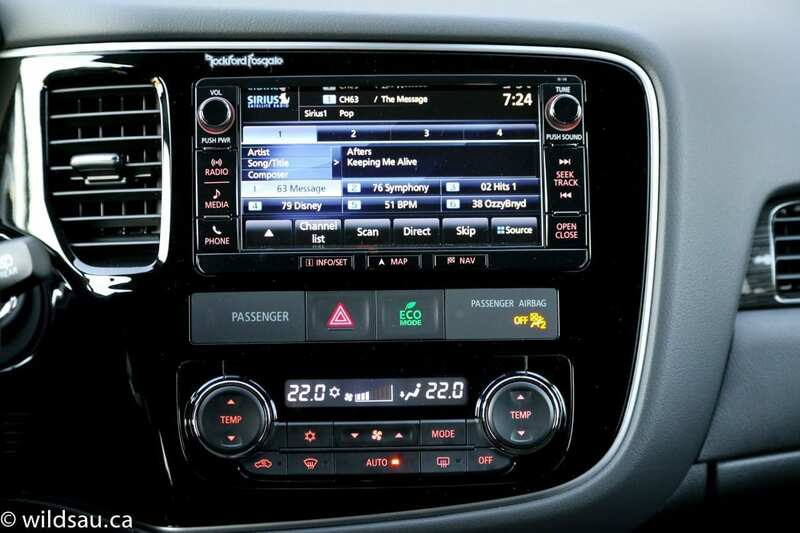 A 7-inch touchscreen handles your stereo (a bass-heavy, 710-watt(!) Rockford Fosgate system with a 10” subwoofer), as well as your phone and navigation functions – the navigation graphics felt a bit dated but overall, I felt that the whole system works pretty well. There’s a dual-zone automatic climate control system and a standard size sunroof overhead, and little touches like a HomeLink universal garage door opener and power-folding mirrors are nice. 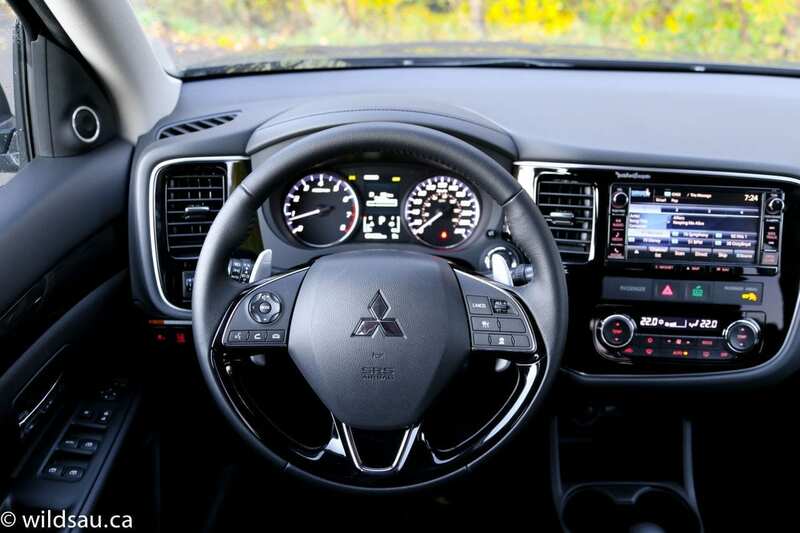 Mitsubishi tucks in some driver-assistance technology as well – lane departure warning, active forward collision mitigation and an excellent adaptive cruise control system. 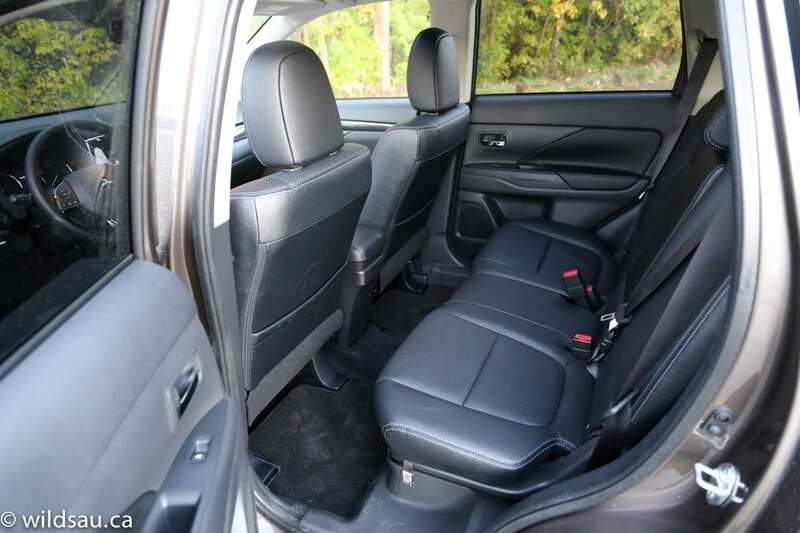 The Outlander’s second row is quite spacious, and I found the head and leg room to be plentiful (for me at 5’10”). The seats are adjustable via reclining and sliding fore and aft, and they also split 60/40 when you fold them. Mitsubishi mentioned that the folding action for the second row seats has been redesigned for easier operation. That may be, but it’s still a three-step process. 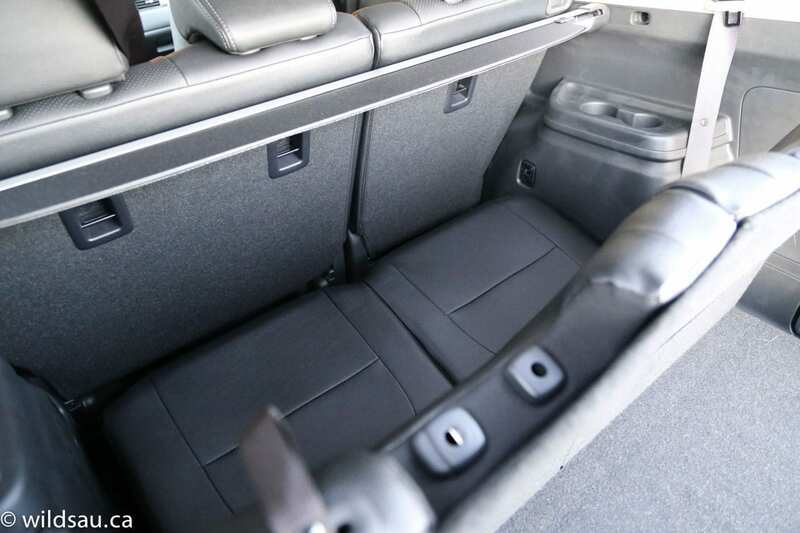 You have to deal with the headrests, then flip the seat cushion and finally fold down the seat back. It might be improved, but it’s still a drag. 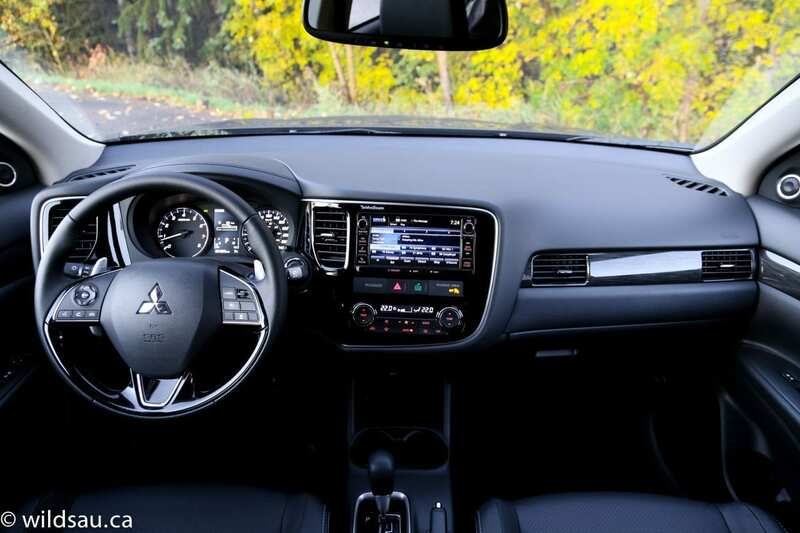 If you’re looking for any sort of creature comforts back here, such as air vents or even a charging plug, keep moving because you won’t find any such luxury in the Outlander’s second row. My mama taught me if I can’t say anything nice, not to say anything at all. So I probably ought to keep quiet on the Outlander’s ridiculous standard-on-V6-models third row. Actually, it folds completely flat so you don’t even know it’s there and that is something nice. Its upright seatback and severely restricted leg room makes it good for emergencies only, and even my third-row-loving kids didn’t want to spend any time back there. Fitting adults back there, regardless of how far forward you slide the second row, boils down to a challenge in basic physics. With all that said, there are plenty of third rows in the industry that are laughable and meant solely for occasional use, so this is more of a broad sweeping complaint than one leveled solely at the Outlander. Places to put my stuff in vehicles are very important to me. I found a few bins in the console as well as space under the armrest lid. 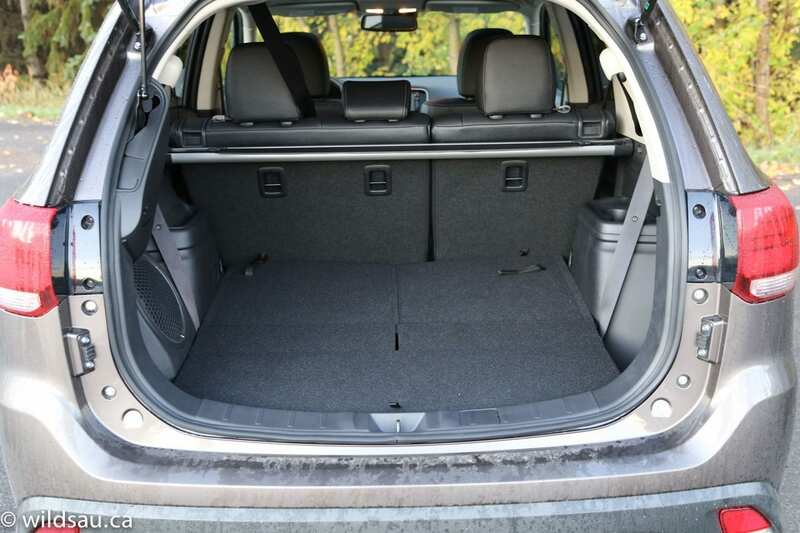 The Outlander’s power liftgate reveals a large 968 litre trunk, which can grow to 1792 litres with the second row folded down. 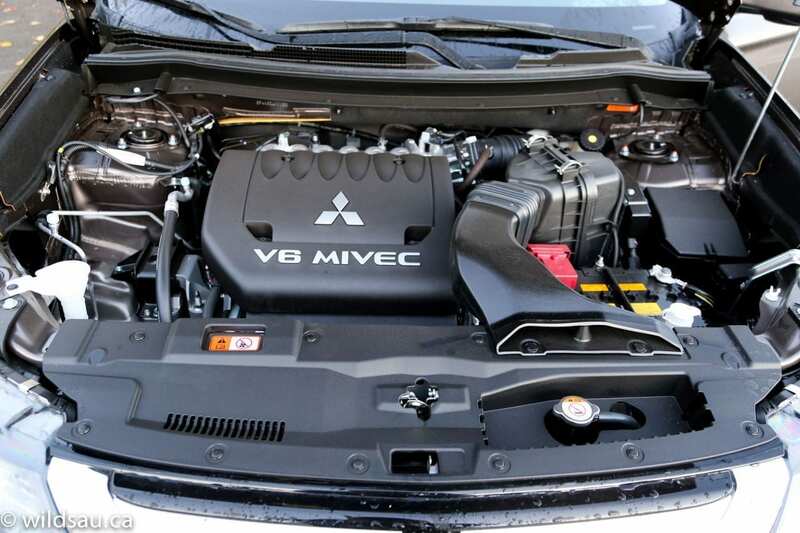 Mitsubishi’s 3.0-liter V6 (putting out 224 HP and 215 lb.ft of torque) carried over but Mitsubishi is quick to remind us that the Outlander is the only Japanese-built compact SUV with a V6. So there’s that. Interesting sales statistics – in Canada, 7 out of 10 Outlanders are sold with V6s, whereas only a small fraction of them are sold with V6s in the U.S. 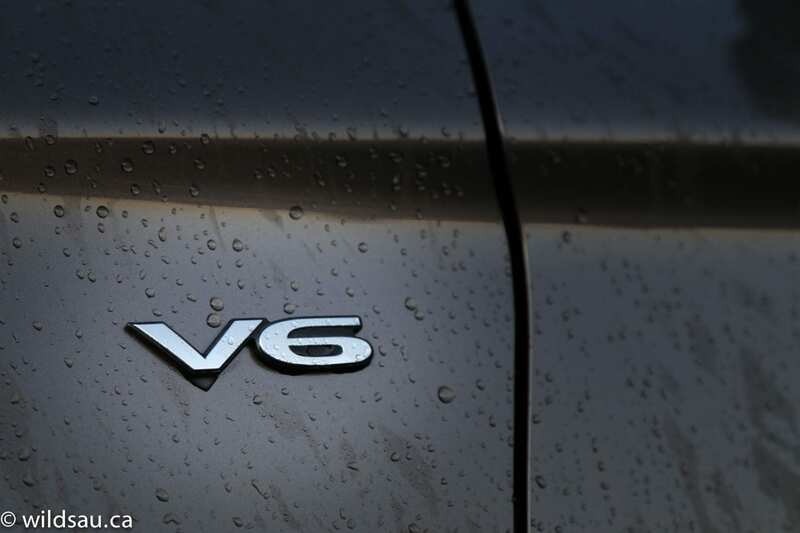 The V6 is mated to a 6-speed automatic transmission and an all-wheel drive system. 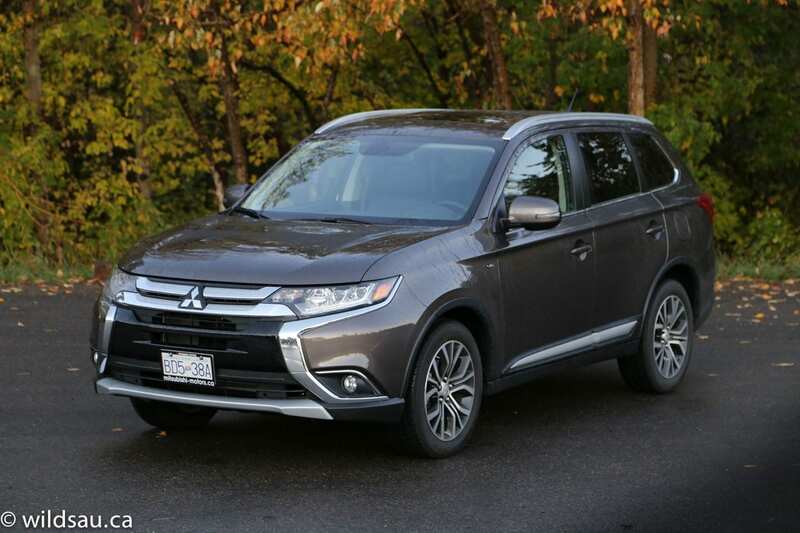 Fuel economy is very reasonable in this class – Mitsubishi rates this trim of Outlander at 11.9 L/100 km (20 US mpg) and 8.5 L/100 km (28 US mpg). I ended up with an average of 13.0 L/100km (18 US mpg) after a week of nearly all city-based commuting. While the Outlander isn’t a particularly powerful vehicle on paper (or versus some of the competition), it is actually relatively light at 1630 kg (3593 lbs) and is quite responsive off the line and around town. It never felt slow or underpowered – especially while commuting. 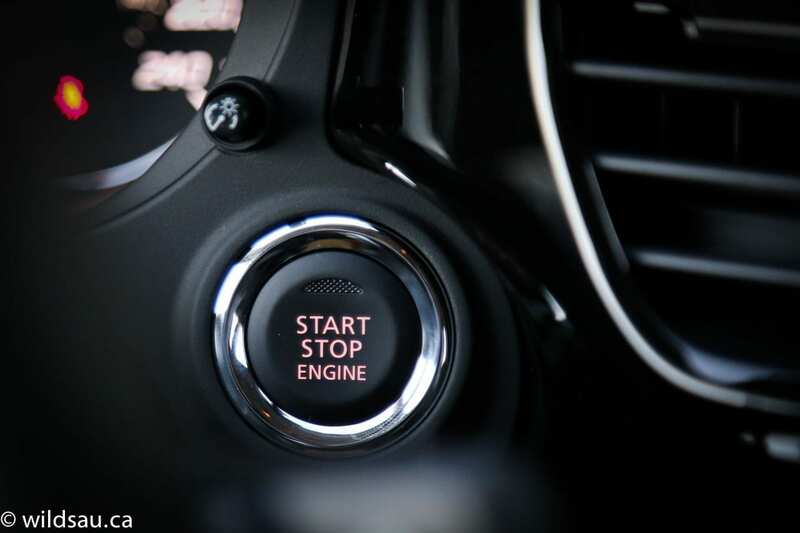 The transmission does a fine job – it’s smooth and relatively intelligent, although it hunts for higher gears quickly in order to save on fuel. 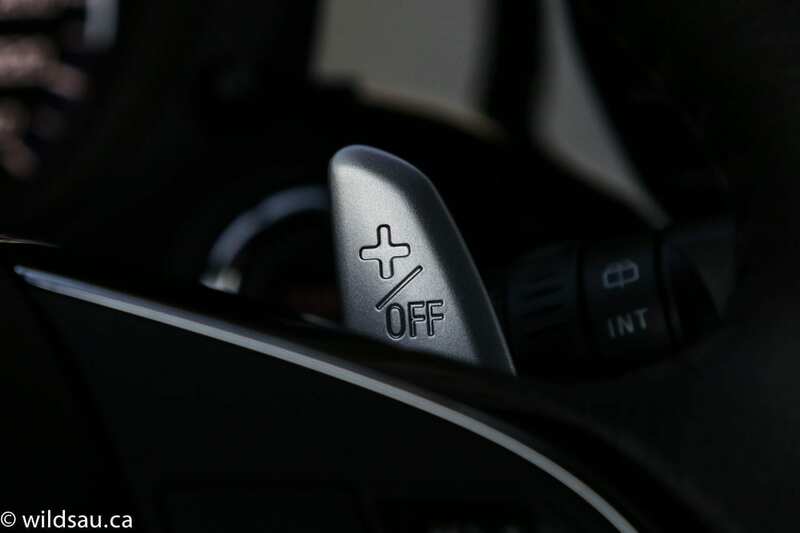 The large paddle shifters remain stationary on the steering column and feel great in your hands – they work well but the shifts are not particularly quick. The Outlander’s ride is firm and gets a tad choppy at times, but overall it’s fine and I always found the vehicle comfortable. Body lean is present in the curves, but the handling is surprisingly competent for this kind of vehicle. Part of the credit for that goes to the Super All-Wheel Control (S-AWC) system. I’m a big fan – it performs very well and seems to apportion power very quickly and intelligently, and allows for outstanding traction – something I got to test on a series of tight, rain-slick curves on a cold morning here in Edmonton. 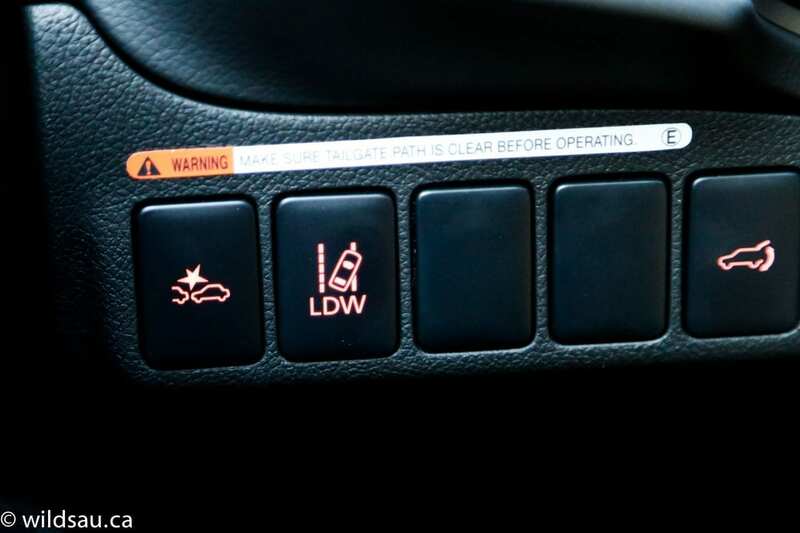 The driver can switch the S-AWC system between Normal (for everyday conditions), Eco (sending power to the front wheels to save on fuel, but engaging the rear wheels instantly when slippage is detected), Snow and Lock (for low-traction conditions). There is also an ECO driving mode, which retards some of the vehicle’s responsiveness to save a bit of fuel. 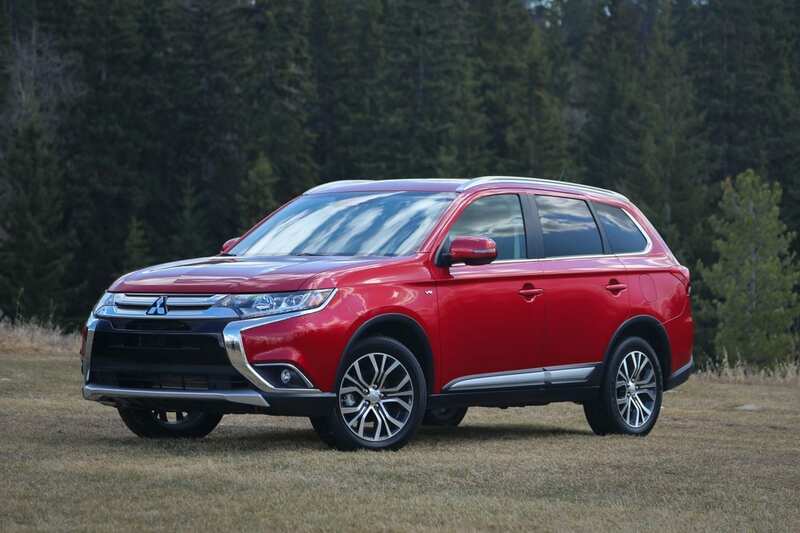 Of the 100+ improvements to the Outlander, Mitsubishi tells me that nearly a third of them are dedicated to making the ride a quieter and more comfortable one. In my walk-around, I learned about new acoustic glass, sound dampening sheets, foam blocks and a bunch of other goodies meant to make the cabin a more comfortable place. Did they succeed? I’d say yes. It is definitely the quietest Outlander I’ve driven and I was impressed by the lack of noise and vibration in nearly every driving situation. If you need to pull things, the V6 Outlander has a 1588 kg (3500 lb) towing capacity. The Outlander is without question an improved vehicle. 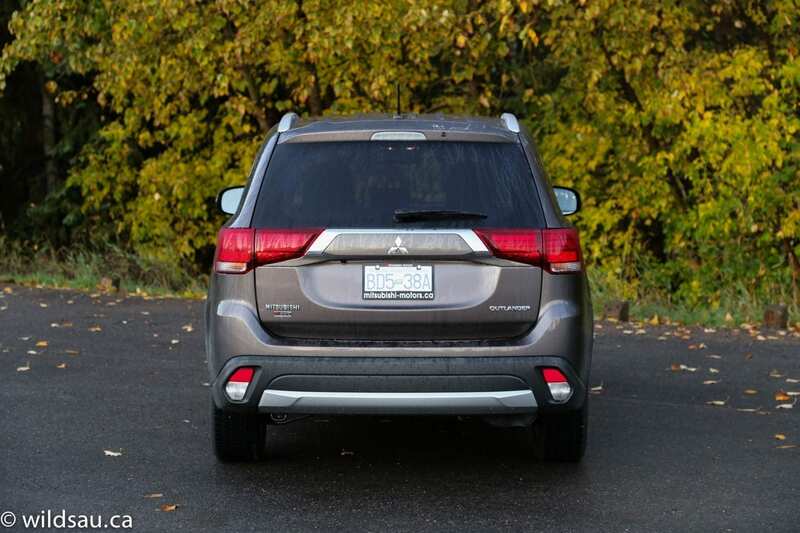 Mitsubishi has certainly went to some lengths to make it a better SUV. It does everything pretty well, yet it isn’t a very memorable vehicle. Mind you, there are few rides in this class that leave an indelible impression on me. 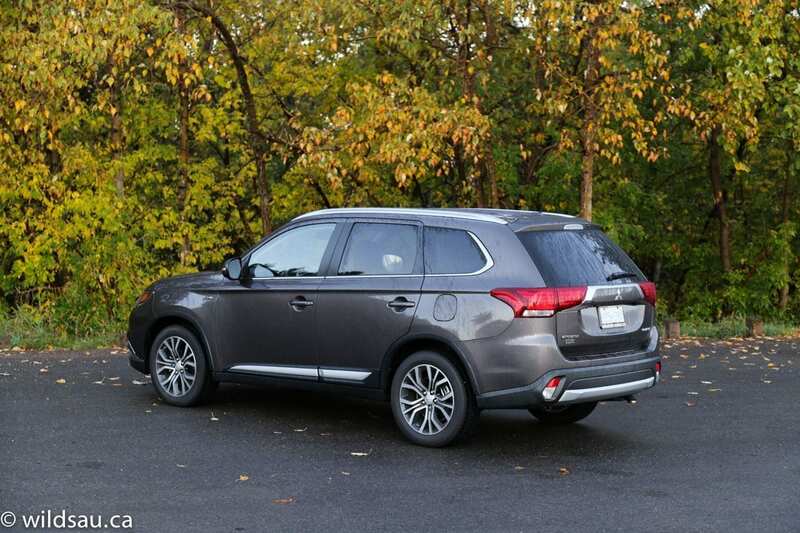 The Outlander can compete on price, to be sure – Mitsubishi has even dropped the price this year, selling it for $430 less than the same 2015 model. 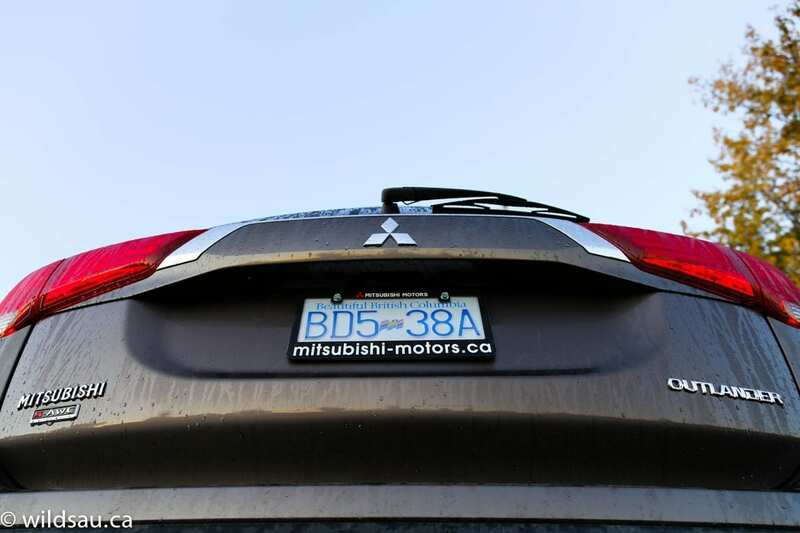 And the vehicle is certainly backed up with a remarkable warranty – Mitsubishi has stuck with their Built Better, Backed Better branding statement, as well as with their 5 year/100,000 km warranty and the 10 year/160,000 km limited powertrain coverage. And that is nothing to sneeze at. 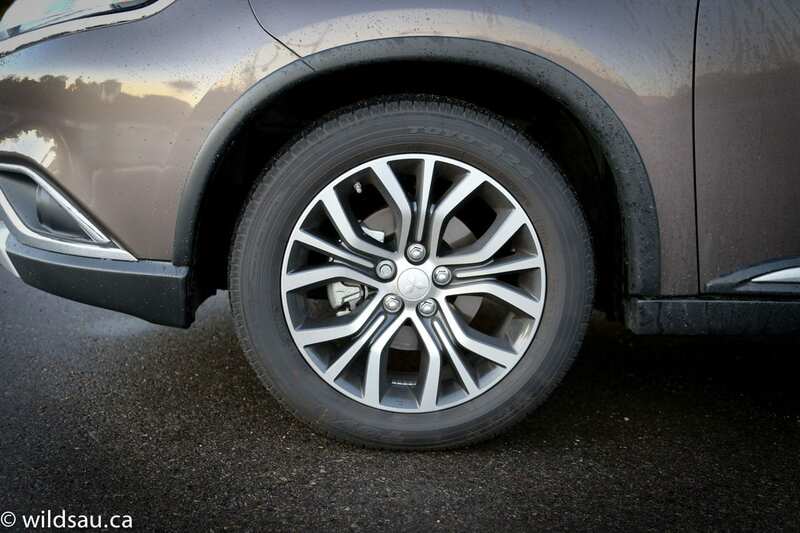 While I think this SUV is a solid offering, it has one big problem – the competition. 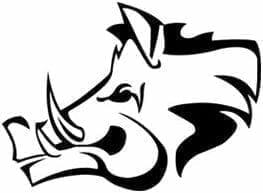 It’s a harsh and unforgiving battlefield in this class and the competitors are not about to relinquish any ground, especially to a stranger, or an Outlander. WAF (Wife Acceptance Factor) was low to middling. She said it didn’t do anything wrong, but there was nothing special about it either. She couldn’t explain why, but she said it wouldn’t be an SUV she would choose.